Case studies are a good way of working with your staff to try out some of the strategies and ideas in this module. Consider doing this activity as part of a training session with your staff team. 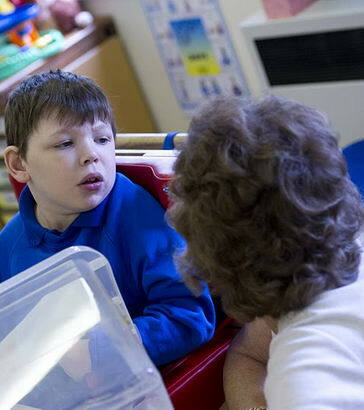 Read through the Case Study of Noel, a nine year old boy with a diagnosis of Autism. Noel enjoys his lunch and has his own routine in the dining hall. The staff who work with him at lunchtime know him well and have learnt to adapt to his preferences. However the staff who have worked with him for two years are leaving and have been asked to write guidance for the new staff who, though experienced in the school, have never worked with Noel before. Read the guidance the staff provided. Using this example, complete key principles grids to support Noel for scenarios 1 and 2 on the next two slides. Today could be difficult for Noel. His bus broke down on the way to school and they waited for 30 minutes while a replacement was found and the children were all moved on to the new bus. Unfortunately this bus had the number 15 in the window (the school buses only go up to 10) and this bus was yellow not white. On the bus the arrangement of seats was different, which meant some of the children could sit in their usual seats but most could not, including Noel. For the rest of the journey Noel repeated phrases from various TV programmes that revolved around the colour yellow. This continued as he got off the bus as he became fixated by the coat of a visitor to school who was signing in at reception. He is by now extremely anxious, loud and starting to pace back and forth. Question: Using the key principles, how would you support Noel to begin to access the school day? This afternoon's activity is Art and is the first lesson of this term. As with most activities, Noel enjoys this, as long as it is done "properly" (his word). He copes best if the whole group are at the table to start and he is prepared for movement around the table, room or in and out of the classroom. If the activity is presented visually and verbally as a sequence of steps he remembers them very well and can easily relate these to staff and his classmates. He can be extremely helpful with the clearing up as long as it is structured and orderly for him, though he is also comfortable if any of his classmates do it. Question: Using the key principles, plan an art activity which supports Noel to achieve.